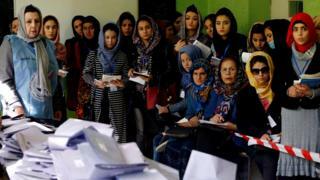 The next presidential election in Afghanistan was postponed by three months, according to the electoral authority. It was originally due in April. A new date for mid-July or early August will be announced on Thursday. Many potential candidates failed to meet the registration requirements, and extreme weather conditions meant that their teams could not organize for a spring date, the BBC said. It comes days after reports that the US should withdraw thousands of troops. Meanwhile, Iran has had talks with the Afghan Taliban, a senior Iranian security official said. Trump's Retreat "Ignores Dangerous Threat"
The decision to postpone the presidential election was also made after a series of problems affecting the October parliamentary elections and the Taliban and Canada were interrupted Islamic State Group. Violence influenced election campaigns and polls themselves, with 10 candidates killed in polling stations and deadly explosions, of which nearly one third was closed for security reasons. The vote in Ghazni province has not yet taken place due to uncertainty and will take place at the same time as the presidential election. In Kandahar, the vote was postponed for a week after her chief of police was murdered there. There were also problems with a biometric verification system as well as delays in many polling stations as the staff came too late. Final results from other major provinces such as Kabul, Herat and Mazar-e-Sharif have not yet been announced. The new parliament will start sitting in March. The elections in this country were also marked by corruption, fraud and voter intimidation.